The Pacific Northwest offers endless rugged beauty, and on this small-group tour from Portland, you’ll explore the gorgeous waterfalls of Columbia Gorge, admire views of wet forests, spot wildlife like eagles and osprey, and tour the vineyards of several wineries, with wine tastings included. Your naturalist guide will teach you about the area’s history and landscape, and ensure comfortable transportation by luxury vehicle. After pickup from your downtown Portland hotel, relax on a scenic drive by luxury vehicle to Columbia Gorge National Scenic Area. Travel along the mighty Columbia River and be on the lookout for bald eagles and osprey, all while admiring the towering basalt cliffs formed from the river cutting through the Cascade Mountains. When you arrive, your professional guide will take you to a few waterfalls. 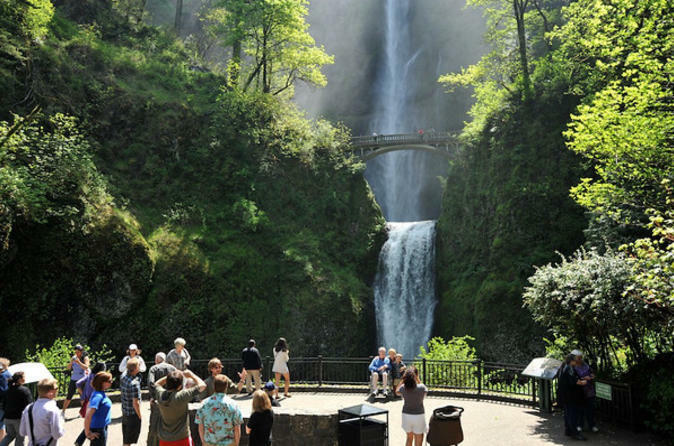 This area is home to the second-tallest perennial waterfall in the US, Multnomah Falls. Spend some time hiking around these stunning natural wonders, and be sure to have your camera ready! Then, continue driving east, where wet forests of the coastal Pacific Northwest provide views of oaks, pines and other arid vegetation, creating prime growing conditions for grapes. As you near the town of Hood River, embark on a tour of a few local wineries, each one unique and charming in its own way. At each winery, relax and sample some boutique wines found only in Oregon. The weather, views and wine make for an unparalleled vineyard experience. In between wineries, your guide will tell you about the history of the land and the region’s culture, giving you an understanding of how this incredible landscape has shaped the wine in your glass. Some of the wineries you may visit include Cathedral Ridge, Wy'East Vineyards, and others depending on the season. After your tour, relax on the drive back to your downtown Portland hotel. Special Offer - Book and travel by October 31, 2018 and save 20% off our previously offered price! - Book Now!